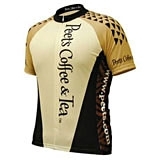 Peet's Coffee & Tea, Inc. (NASDAQ: PEET), a specialty coffee roaster and marketer, today introduced a custom, high-performance Peet's cycling jersey, available only at peets.com. One hundred percent of the profits will benefit The Leukemia & Lymphoma Society's Team In Training, a non-profit organization committed to blood cancer research and patient care. Peet's created this custom, high-performance cycling jersey to salute the cyclists who are among Peet's dedicated and loyal customer following and offer them the opportunity to help Peet's raise over $30,000 to help fight blood cancer. Over the years, Peet's has fueled numerous cycling clubs, cycling professionals and Team in Training participants. "Making this donation to The Society represents something that is near and dear to the hearts of our entire Peet's family," said Erica Hess, manager, brand communications, Peet's Coffee & Tea. "Many of our own 'Peetniks' have trained and competed in Team In Training cycling events such as the Treasure Island Triathlon, Pacific Grove Triathlon, and the San Francisco and San Diego Marathons to raise funds for The Leukemia & Lymphoma Society." "We're delighted that Peet's Coffee & Tea is supporting the Team In Training cycle program," said Greg Martin, Executive Director of The Leukemia & Lymphoma Society's Greater San Francisco Bay Area Chapter. "Their generosity is overwhelming and the sale of these cycling jerseys will ultimately help The Leukemia & Lymphoma Society fund blood cancer research and patient services. The people at Peet's are invaluable teammates in the fight against blood cancers." The Peet's Limited Edition Cycling Jersey is available exclusively at www.peets.com for $69.95 while supplies last. ABOUT PEET'S COFFEE & TEA, INC. Founded in Berkeley, Calif. in 1966, Peet's Coffee & Tea, Inc. is a specialty coffee roaster and marketer of fresh, deep-roasted whole bean coffee for home and office enjoyment. Peet's fresh-roasted coffee, hand-selected tea and related items are sold in several distribution channels including specialty grocery and gourmet food stores, online and mail order, office and restaurant accounts and company-owned stores throughout the United States. Peet's is committed to strategically growing its business and to maintaining a unique culture and focus on customer satisfaction. For information about Peet's Coffee & Tea, Inc., visit www.peets.com or call 1-800-999-2132. Peet's Coffee & Tea, Inc. shares are traded under the symbol PEET. The Leukemia & Lymphoma Society's Team in Training is the world's largest endurance sports training program. The program provides training for marathons, triathlons and cycling events, while the athletes raise money for blood cancer research and patient services. Since 1988, more than 265,000 participants have raised more than $595 million. Pete's Coffee & Tea, Inc.